Are you wanting to take your 3D printing knowledge to the next dimension? 3DX is the perfect opportunity for people of all ages to learn cutting edge skills of how to use 3D printers and open source technologies that help turn a “Concept-to-Reality”. The 3D Experience, or 3DX, is a certification program that teaches students and teachers the design and development process of learning how to create your own 3D technologies. Each week students will learn how to use the 3DLSX platform to create a new 3D project. 3DX Level 1 classes provide weekly exercises using a variety of 3D CAD design software, 3D printers and other machines to create physical parts for electrical/mechanical components that will be programmed to interact with the 3D environment. Successful completion of the class and rubric awards a 3D Literacy® Level 1 Certificate. 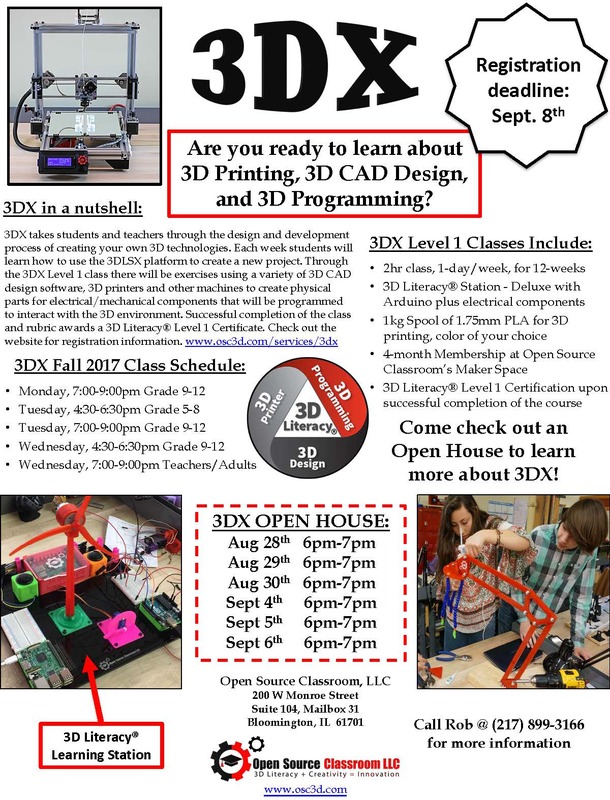 Weekly 3DX classes are held at Open Source Classroom’s Maker Space in DT Bloomington. Classes start the week of September 11th, 2017 and end the week of December 11th, 2017. We have several different age groups and time slots available.